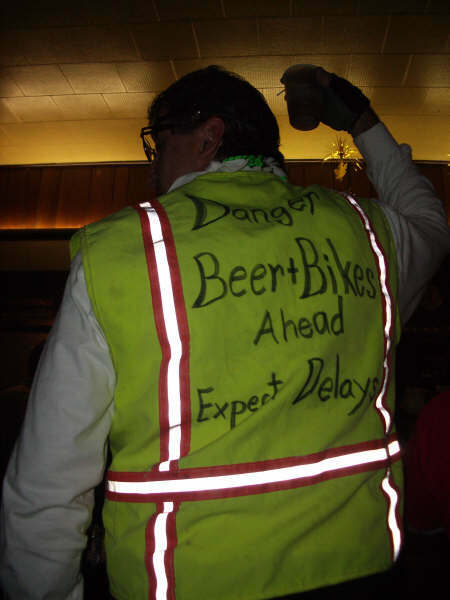 I own one of these reflective vests. Actually I found it on the side of the road while I was driving. However, I haven’t started using it yet. Do own one and if so, do you use it? Heh. No. My bag has a blinkie and two huge reflective stripes on it. I see people wearing them occasionally, ususally going very slow. I commute with a backpack so, no, I don’t use one. However, my co-worker fellow bike commuter bought one at a hardware store for cheap and swears by it. I think we should all dare Nick to wear one of these during his commute. Must have pictures to prove it. Come on Nick…are you chicken?? I use a reflective strap. My wife and I, both bike commuters, have modified 2 so that they velco onto our backpacks. This time of year we also were these type of vests when we go out running after work. I’m a firm believer in being seen on the roads. Dares are empty threats, Jay, and I’m no McFly. Find proper compensation, and I’ll rock the fines-doubled-for-speeding-in-a-work-zone look for a day. CommuteByBike only encourages safe and sane cycling. Jay why don’t YOU send us a picture of you wearing..or are ya’ Chicken? I use a reflector belt that I wrap around my Camel Back. I’ve thought about it. My morning rides were very limited this summer since Indiana decided to observe Daylight Saving time. It is very bright. I am considering writing the letters G-E-E-K on the back to reality of my situation. However, my wife loves it. Between the vest and three big lights on my bike and helmet, she no longer worries about me not being seen when riding in the dark. Some sacrifices are worth making. This is the kind of vest I’d wear.